Mathias Cheung, Emma Park and Douglas James win the prize for Best University/Law School team. Three students on The City Law School's Bar Professional Training Course (BPTC) - Mathias Cheung, Emma Park and Douglas James - carried off the prize for Best University/Law School Team at a competition run by the Worshipful Company of Arbitrators on the weekend of the 16th to 18th January. The competition was held in the City offices of law firm Berwin Leighton Paisner (BLP) and involved teams from across the legal profession, including the University of Law, Atkin Chambers and Linklaters. 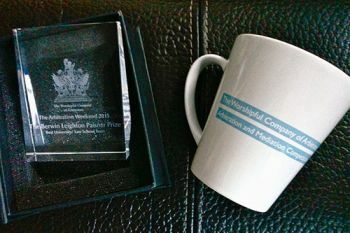 Competitor teams comprised two to three persons and were allotted roles in their case which culminated in an award delivered by the 3-person Tribunal - Dr Robert Gaitskell QC, Carol Mulcahy from BLP and Paul Rose of the Worshipful Company of Arbitrators. Based on a real-life International Criminal Court (ICC) arbitration, the competition case was a contractual dispute in the fictional nation of Danubia, between a vendor German company specialising in deep-sea diving equipment and a purchaser company. "The Competition began on Friday with a showdown between Atkin Chambers and Keating Chambers in an Emergency Arbitration before Nicholas Fletcher QC which carried on for a further two days, with different teams participating in different stages and roles throughout. Our team represented the respondent purchaser in an application for strike out, an examination-in-chief, the closing submissions on the law, and a final reply on costs after the Arbitral Award was delivered. After the weekend, we all acquired a firm grasp of the flexibility of the procedures, the application of the law to the facts, and the importance of persuasion and advocacy." Mathias was also offered an individual summer internship with BLP and received a special mention from the Tribunal with three other participants who are trainees and pupils as "the client's dream". He recommends this competition to future students and states that it is "an immensely fruitful experience for any law student, giving us an insight into the practicalities of commercial law, in world increasingly resorting to alternative dispute resolution such as arbitration and mediation." Arbitration is a formal, private and binding process where disputes are resolved by a final award made by one or more independent arbitrators. The process of arbitration is a faster, simpler and less expensive alternative to litigation.